Goodbye spring and summer! Delicate, pastels are out and for a home that impresses this autumn you need to embrace rich woods and deep shades like purple and navy, old fashioned pinks and gold. This autumn and winter, the interior trends we’re going to be seeing involve oversized florals, modern neutrals, bright shapes and vintage (check out our vintage furniture blog here >). To create a modern neutral vibe in your home, you need to embrace stripped back furniture and soft grey fabrics. Our oak sideboard and oak dining table are perfect for modern neutral homes. You can choose the exact fabric you want when you choose any of our upholstered pieces. You can have gold accents throughout your home, adding a touch of class. Gold has year-round appeal. Why not choose a fabric that has gold running through it? It will make any piece extra special. We have hundreds of fabrics from you to choose from. When revamping your home this Autumn, consider every room in your home, from your lounge to your bedroom, your hallway to your dining room. If you want a bedroom that wows, we could design a headboard that’s unique to you. A deep purple fabric could add warmth and give your bedroom a cosy feel. 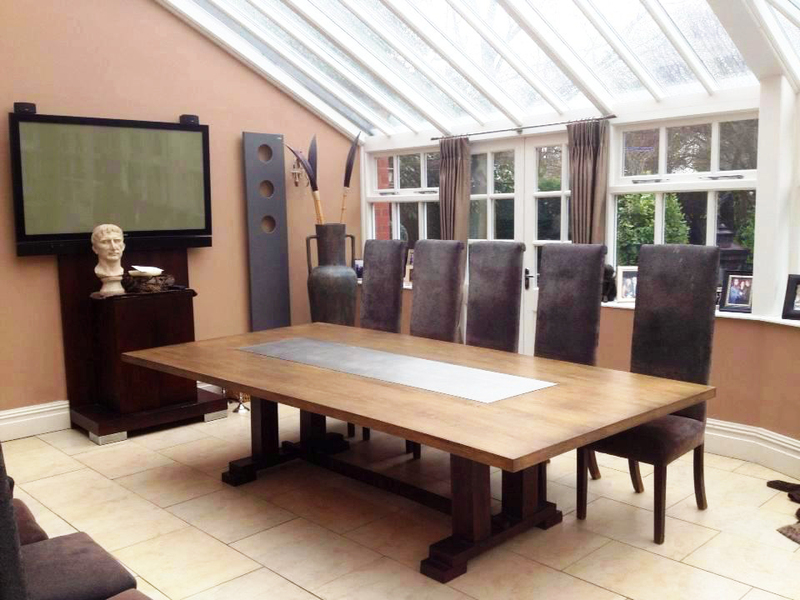 We recently completed a bespoke furniture project for BBC weather presenter Clare Nasir. Clare wanted a one-of-a-kind sofa for her daughter’s bedroom. The circular sofa is right on trend, it’s upholstered in bright fuchsia fabric by Christina Marrone, and certainly is an interesting shape! Why not commission us to design a totally unique piece for you? Whether you want rich woods, deep shades… or something completely different, we can create an amazing piece of furniture just for you. Give us a call on 01925 419121 or fill in our contact form and we’ll call you at a time that suits you.